So here is a non exhaustive list of additions coming to the game. We have a lot more than this in store (not yet discussed), but Xealaz over at reddit compiled such a nice list of the stuff we HAVE discussed that I wanted to share it with you. As always, things are not set in stone. 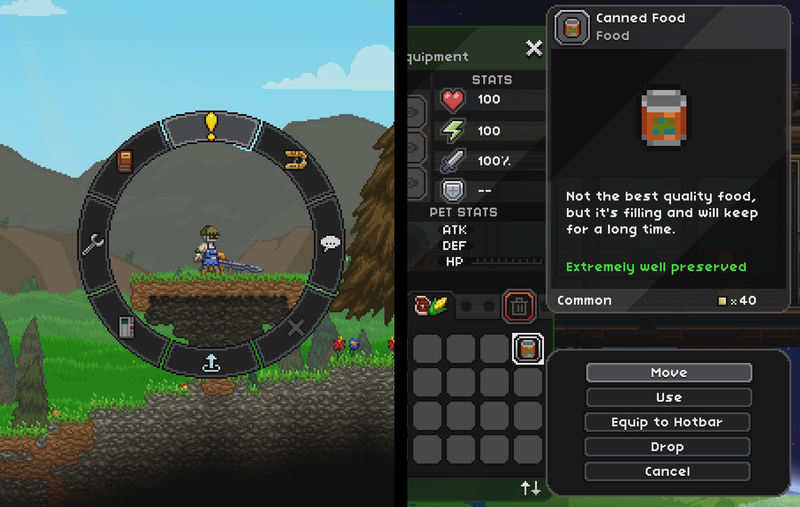 NPC Spawners & Building Logic: NPCs will scan the structures you build around them and the contents of chests; they will have improved inventories/behaviors depending on how valuable their surroundings are. Space Combat: Way in the future, expect space combat and the ability to board other ships. Spaceship Dungeons: Very large, size of a planet. 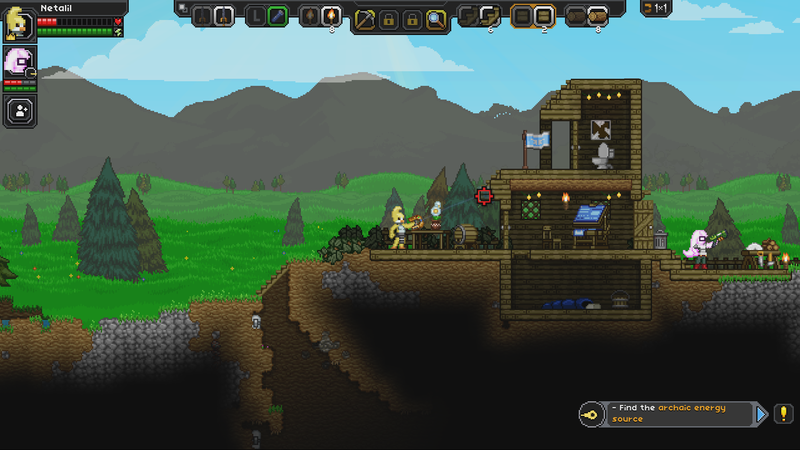 Biome Hazards: Sandstorms, icestorms, meteor showers, toxic planets, airless planets. Story Missions: Eventually each tier will end with a story mission that ends with the bosses you see now. Ship Navigator Changes: Still not set in stone; but the new idea is to give a local map with fog of war. Instead of sector buttons you have to fly out of a sector and into the next one by uncovering more of the star map. The final sector would be infinite. Monster Generation: Right now, monster parts just have stat boosts, but eventually rolled monster parts will affect their behavior and abilities. For example, monsters with spider legs can climb walls; fiery monsters inflict burning. You might get a burning spider dropping on you from the ceiling. Projectiles may be tied to specifically generated heads. Biome may influence monster part generation. Mini-Map: Rotating circular map showing highlights only such as the location of friendly players, spawn points–but no major details. For the details you’d use a mapping item to create a map as you travel. Teleporters: Stargates between planets and eventually between servers. Dramatic Planet Modification: Not going to be implemented any time soon. Ability for players to modify huge chunks of planets through things like orbital bombardment; removing the entire first layer of a planet and leave behind a lifeless surface. Tech Priority: Eventually all techs can be active at once, but a categorization system is in the works to assign priority to conflicting techs, preventing issues. A hotkey to switch the active tech will be added as a temporary workaround until the priority system is completed. Server Commands: More server commands and control for chat and port listening. Villager AI: Villagers will aggro when you steal from them and follow you more aggressively. World Storage: Improve world storage and organize *.pak files to improve modding. Add launcher integration. Spawn Points: Change spawn points on individual planets. Ship Size: Upgrade ship/increase size. Racial Armor: Racial abilities will not be inherent but will be tied to racial armor. For example, Avian armor can glide downward. Capture Pods & Mercenaries: May be able to capture NPCs with pods. Summon NPC Mercenaries by using the pod as a beacon. Reduced Wipes: Working on a system to patch without requiring as many character wipes in the future. This will require one more wipe and that’s it. Other Changes: Colorblind Mode & Engine Optimization. FTL animation being revamped to reduce memory strain.